Two losses over the weekend have cost Texas its standing among the nation’s top teams. Texas was voted out of the D1Baseball poll on Monday. Previously ranked 14th, Texas (23-15) did add two wins to its resume last week. UT, however, was penalized by the pollsters due to its 6-4 and 2-0 losses to lowly Kansas State (16-21). This is the first time this season that Texas isn’t ranked in the D1Baseball poll. Four weeks ago, the Longhorns was ranked ninth in the website’s rundown of the nation’s top teams. With a 5-6 showing in conference play, Texas currently finds itself behind six teams in the Big 12’s clustered standings. Baylor leads the Big 12 with an 8-3 record. 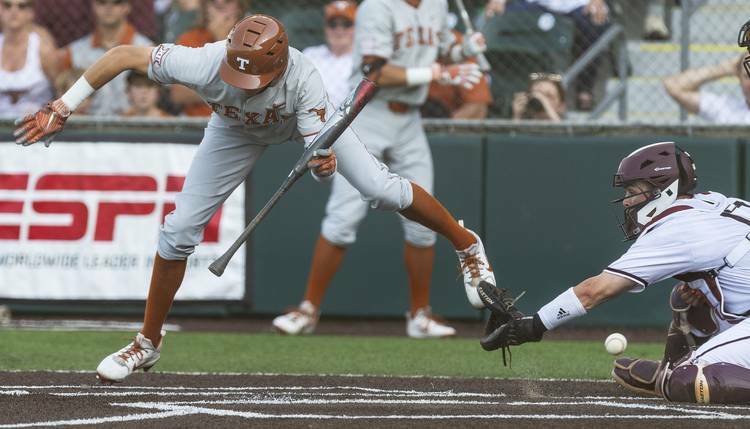 Texas, which won the conference’s regular-season title in 2018, only trails second-place Oklahoma State by 1.5 games. Texas will attempt to rebound when Lamar (13-23) visits UFCU Disch-Falk Field on Tuesday. Oklahoma State is then set to host Texas for a three-game series that begins on Thursday. Like Texas, Oklahoma State (21-13) is coming off an odd weekend. The Cowboys hit a Big 12-record 12 home runs in a 27-6 rout of Kansas on Friday, but the Jayhawks responded with two walk-off wins.